There is so much to say about this cookie recipe I am sharing with you today. I was pretty nervous about how it would turn out. A cookie with half the butter and and a third of the sugar that I normally use had me skeptical enough. Then, lets just take all the flour out and add ground almonds instead– that will work! Clearly, I had very low expectations when I started to make this recipe. 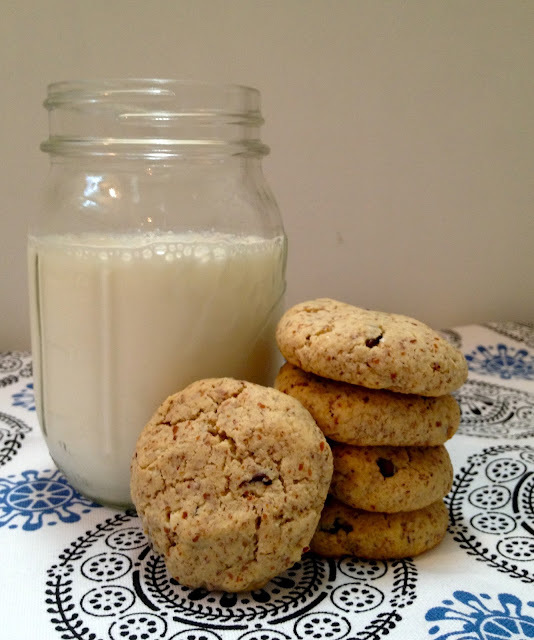 -I prefer almond meal to almond flour in this recipe. I liked the texture the meal added to the cookie, the cost being considerably lower didn't hurt either. - Not all almond meal is gluten free! If you have a gluten allergy be sure to check your package. My batch of cookies were not technically gluten free as the almond meal I bought at Trader Joe's was apparently processed in a plant with wheat. Not a problem for us but could be for many people. Preheat oven to 375 and line a cookie sheet with parchment or a silicon mat. In a large bowl cream butter and sugar. Add the eggs in one at a time followed by the vanilla. Add in the salt, baking soda and almond meal and mix until combined. Mix in the chocolate chips and any other add-ins you desire. Roll the dough into 1-inch balls and place on prepared cookie sheet with about an inch in between each ball. Gently press the cookies down until they are about 1/2-inch tall. Bake for about 10 minutes until they do not show an indention when touching them gently (they will not get very golden in color). Remove from baking sheet onto a cooling rack or parchment paper.